Please do not take solar as primary recharge source, as the charging speed will subject to sunlight intensity and panel conversion rate and it takes a week to obtain a full recharge when powering only with sunlight. Dual USB and powerful LED Flashlight:Makes it easy to charge two smartphones simultaneously or a tablet at full speed.2led lights can be used as flashlight with Steady-SOS-Strobe mode. Five pilot indicators show the status of battery charger timely. Green light on when charging by solar, blue light on when USB charging. 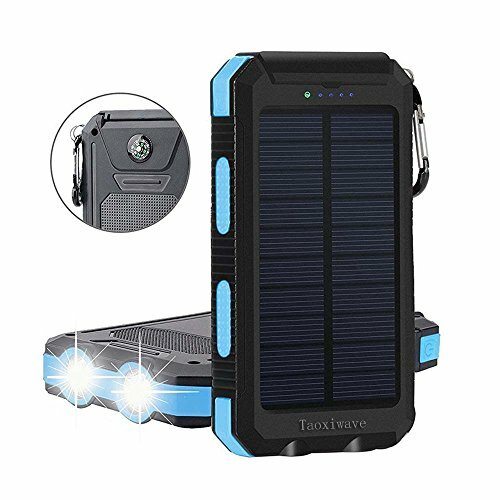 If you have any questions about this product by Taoxiwave, contact us by completing and submitting the form below. If you are looking for a specif part number, please include it with your message.